It has been very busy around here over the past week. Unfortunately, too busy to get out updates with the frequency I would have liked. This entry should cover most of the highlights and I am happy to say there were many. Last week, Mom continued to regain energy as she shook off the chemotherapy drugs. Her main source of energy; however, was visits from loved ones and dear friends. 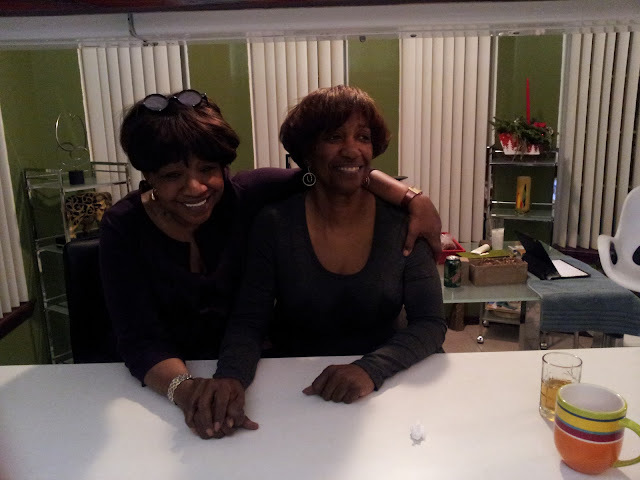 Before the weekend last, one of Mom's closest cousins, and her very first friend came to visit. Each the eldest daughter to twin brothers, Mom and Bernadette were born two days apart and practically twins themselves. The first evening allowed Mom, Bernadette, Judy (Bernie's sister-in-law), Elois, Glenda, and Cheryl to sit down to a nice dinner at the table used only for special occasions. I mistook Mom's plate for my own because she had loaded it up with so much food. While she didnt eat it all, she ate quite a bit, including dessert. The cousins shared stories of growing up together with the other women. Bernadette, a multiple cancer survivor offered many words of advice and encouragement to Mom. She inducted her into the "Bloody Turnip" incredible cancer survivor club. After about 2 hours, Mom was ready to rest so the women saved their catching up for the next afternoon. Early the next morning, Elois sneaked out to catch a 6:00 am flight to spend a very deserved Christmas break with her family. Mom used the morning to nap and rest, building up strength for doing some things she hadn't done in a while. The first thing she did was arrange for the women, Matt, myself, and Mickie (Marley joined us too) to eat at her favorite place in Nob Hill, Flying Star. All of us, worried about the effect the amount of time spent out would have on Mom, hung on every word and were constantly looking for signs of her getting exhausted. We anticipated her words and actions so much we almost ruined her attempt to sneak around the corner to get Bernadette and Judy Christmas presents. After a few of us followed her to interpret her actions, and realized that she was trying to get us to be complicit, we split the group up so she could quickly shop. We made it back to her house where she slept until the early evening. When she woke, Judy did Mom's hair to match Bernadette's style. Both Bernadette and Judy took turns massaging Mom's hands and feet. The women continued to relive memories until Mom ran out of steam. Cheryl and Glenda read scripture, we prayed, and before they said their goodbyes, Mom gave each the presents she deftly procured. Bernadette and Judy's Saturday morning departure allowed Mom to use most of Saturday to rest and prepare for Christmas visitors. Saturday night brought Gary to town. He happily accepted staying with and supporting Mom and Cheryl at the house. Gary is one of the most caring people you will meet and is a natural at the job if there ever was one. On Sunday, Glenda went home to spend Christmas with her family as more of Mom's began to stream in. The first of Cheryl's children arrived. Cameron and Barrett, the analog for Matt and I of Bernadette and Mom's relationship, drove in with their younger brother, Bradley. Traveling along were Uncle Greg's children, Adrian and Darian. Greg got in shortly after our cousins arrived. Rather than overwhelm Mom with the entire party, Greg took his children to see their aunt, while I took Cameron, Barrett, and Bradley to catch up over pizza and a beer. On Monday, Mom arranged for the entire group to meet at our house. Cheri and shortly after, Lloyd, came straight from the airport. We ate, shared love and tears with Mom, and watched videos Cameron's daughters recorded for her. She watched Ajili's videos again so that she could share with her siblings On Christmas, Mom's brother and sister in law, Ronnie and Liessa flew in. Mickie, our girls, and I arrived before most to prepare the food. Delighted to see GiGi, after not seeing her for so long, the granddaughters spent a lot of their time in and around her bed. After everyone arrived and as the food cooked, Ronnie gathered the entire group and read to us the Bible's account of Jesus' birth in chronological order alternating between Matthew and Luke. This led to blessing the food, and breaking of bread. Mom watched us eat as she was not very hungry. After everyone cleaned their plates, Mom called us to gather around the tree. She thanked God for her life and family. She expressed thanks to each individual and then gave out presents. She started with the granddaughters. Mom, sensing this may be her last Christmas with us, wanted the girls to have something that would serve as a constant reminder of her undying love for them. For each family she wanted to give a new pet, a dog for ours and a cat for Matt's to be with them every day of their childhoods. She did so by giving them Build-a-Bear dolls that represented their soon to be additions to the families. This led to two "funny things kids say" moments. Mom had promised the girls a puppy since early last year when our family dog of 15 years, Melanie, died. Soleil took it the hardest of all. She had truly inconsolable moments for nearly 6 months. So, Mom thought she had the perfect setup question to introduce the future puppy. "Soleil, who in your family died last year?" she asked. Soleil responded, "Jesus Christ!" The room burst into laughter. Shortly after, GiGi told Violet how she knew that what she wanted was a kitty. When Violet opened her Build-a-Bear, she exclaimed, "But I wanted a real kitty!" Again, the the house came down. After the remaining gifts and cards were exchanged, we all followed Mom into her bedroom. Ronnie told a few stories before leading into song. We sang a few gospel songs before ending with the grandchildren leading the adults into a version of "Say a little prayer," by Aretha Franklin. For as much as there was going on and as many people as there were, Mom was able to keep pace and astonish each of us with how much energy she had. Over the week, she visibly was eating more which resulted in her gaining 2 lbs since the week before. Although recently expressing her fear about not making it to Christmas, she cruised through it with courage, strength, and grace and set her sights on getting to one more. Our family singing "I Am Not Ashamed" this Christmas led by niece, Cheri Evans. Arlene is truly blessed to have this family surrounding her. Thank you for sharing. Your love, strength and faith are such an inspiration - and what a talented and beautiful family! I now know more than ever why you are so proud of them. Thank you so much for all the hope and growth that you continue to promote in my life. You have made it possible for so many of us to improve the life chances of thousands of children each year. The positive impact of your love of children, skill and commitment will be felt for generations to come. Your spirit is a true reflection of the courage and commitment you've had in everything you do. What a treasure you are to your family, friends and colleagues. It was such a delight to visit with you briefly at the end of your flight to Texas from Costa Rica last March. As you embrace this next challenge, I know that your love of Christ, your passion for excellence and your dedication to family and friends will give you the ability to persevere. I've been praying for you and following your blog....I'm also having challenges getting this message to actually post. Know that you have another friend out here in Washington State who gives you support. I am so glad to know that you had a wonderful Christmas with your family and friends, Arlene. The song was beautiful, touching, and uplifting. Happy New Year. Happy New Year Arlene and family! What a touching way for all of us to share our love for Arlene. Continue to hold onto God's unchanging hand. Your strength, grace, and courage are a blessing to all of us. And so is your faith. You will continuously be in my prayers. God Bless You. Happy Birthday Cuz!! Here's another of my "Hey Arlene" episodes. I hope you enjoy it. Anthony, please wish your mom a happy birthday for me today. Also, if she's in good enough condition to care, please tell her that her second UELP student -- Karren Dunkley -- defended her dissertation yesterday. Arlene should be very, very proud of all she did to nurture these very talented students along. Arlene, what a wonderful song you and your family shared together. Family is really all we can count on during trying times, but I must truly say you have friends that are stellar.the love and caring shown to you is just wonderful. Shively and I send you best wishes and you have our constant and continued prayers. Happy Belated Birthday, we love you.